BRECKINRIDGE, John Cabell, (grandson of John Breckinridge, father of Clifton Rodes Breckinridge, and cousin of Henry Donnel Foster), a Representative and a Senator from Kentucky and a Vice President of the United States; born at Cabells Dale, near Lexington, Ky., January 16, 1821; attended Pisgah Academy, Woodford County, Ky.; graduated from Centre College, Danville, Ky., in 1838; later attended the College of New Jersey (now Princeton University); studied law in the Transylvania Institute, Lexington, Ky.; admitted to the bar in 1840; moved to Burlington, Iowa, but soon returned and began practice in Lexington, Ky.; major of the Third Kentucky Volunteers during the Mexican War in 1847 and 1848; member, State house of representatives 1849; elected as a Democrat to the Thirty-second and Thirty-third Congresses (March 4, 1851-March 3, 1855); was not a candidate for renomination in 1854; was tendered the mission to Spain by President Franklin Pierce, but declined; elected Vice President of the United States in 1856 on the Democratic ticket with James Buchanan as President; unsuccessful candidate for President in 1860; elected to the United States Senate and served from March 4, 1861, to December 4, 1861, when he was expelled for support of the rebellion; entered the Confederate Army during the Civil War as brigadier general and soon became a major general; Secretary of War in the Cabinet of the Confederate States from January until April 1865; resided in Europe until 1868; returned to Lexington, Ky., and resumed the practice of law; vice president of the Elizabethtown, Lexington Big Sandy Railroad Co.; died in Lexington, Ky., May 17, 1875; interment in Lexington Cemetery. American National Biography; Dictionary of American Biography; Davis, William. John C. Breckinridge: Statesman, Soldier, Symbol. Baton Rouge: Louisiana State University Press, 1974; Heck, Frank. 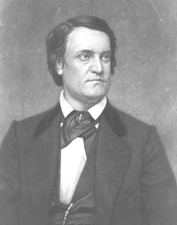 Proud Kentuckian, John C. Breckinridge, 1821-1875. Lexington: University Press of Kentucky, 1976.